Arnold Alexander Saba was born in Vancouver in February of 1947. He was born into a wealthy family and was the eldest of four children. Saba began drawing comics at a young age, having a very fertile environment in which to develop his skills. His mother, Allison McBain, was a cartoonist and comics enthusiast herself, and granddaughter of Mary “Dolly” Collins, a Manitoba cartoonist. Predominantly raised on newspaper strips and collections of Caniff and Barks, most of Saba’s earliest renderings are in a similar vein. 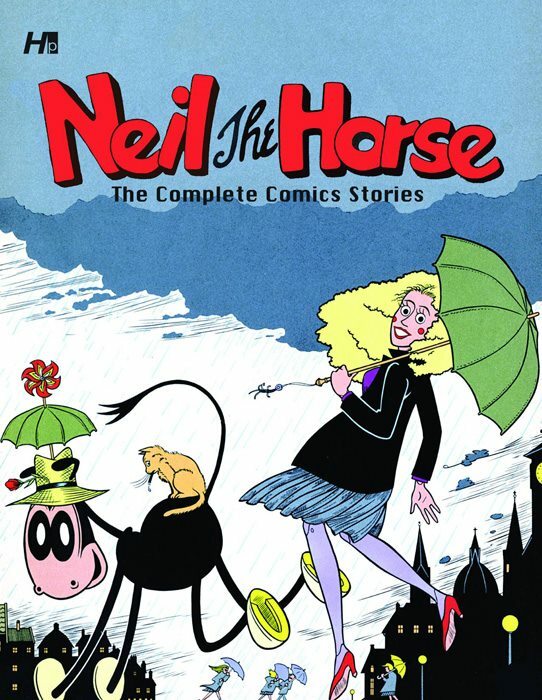 However, it wasn’t until 1975 that he first published Neil the Horse, the comic that dominated his cartooning career. Stylistically, the comic is most reminiscent of early Disney cartoons, but because of the mélange of characters, styles and form, it transgresses any real comics tradition. Saba experimented with many forms of pop culture not normally associated with comics such as paper cut outs, musicals and dances. In 1977, Saba moved from Vancouver to Toronto to be immersed in the Canadian comics scene. He continued to develop Neil the horse publishing it in a multitude of forums, and in 1980 he published one of these stories with Potlatch Publications in the 1980 Comics Annual. Eventually Saba was in contact with Dave Sim and Deni Loubert, and in 1982 Neil the Horse appeared in the “Unique Story” section of Cerebus No. 41. Sim reserved this section for other independent creators and so Neil was featured alongside Normal Man and Bone. But, in February 1983, Neil the Horse graduated and was featured in his own book published by Sim’s company Aardvark-Vanaheim. Saba was even deeper in the comics community as he was also developing a five-part radio documentary on CBC, The Continuous Art, which explored the cultural position of comics. He conducted many interviews including those with Milton Caniff, Floyd Gottfredson, Hugo Pratt, Will Eisner, Jules Feiffer, and Russ Manning. His interview with Hal Foster is famous for being Foster’s last interview. Also on the radio at this time was Saba’s radio musical called Neil and the Big Banana which did very well. Although Neil survived the separation of Aardvark Vanaheim titles as the non-Cerebus titles moved to Deni Loubert’s Renegade Press imprint, it only lasted 15 issues, the last of which came out in 1988. This did not mean the end of Neil. Between the years of 1988 to 1993, Neil the horse was optioned in Hollywood. Saba began taking Neil in all possible directions. Saba was pursuing three avenues of publication: the stage musical, the graphic novel and the TV series. In September of1993, all three were rejected. It was at this point Saba decided to abandon hopes of developing Neil the Horse and began to pursue other options. During this time he had been living in San Francisco for five years, and had begun to realize his transsexual transition. By the end of 1994, this transition was completed, and Saba began a new life as Katherine Collins. At around the time Collins’ transition was complete she met and fell in love with her long time partner, Dr. Bobbie Bentley. Collins continued to work as a commercial illustrator for a couple years before departing from illustration altogether. In the late 90s, Bobbie was diagnosed with terminal cancer. For the remainder of their five-year relationship, Collins cared for her until she passed in July of 1999. From there, Collins “drifted, without much purpose, for a few years after Bobbie died”, finding satisfaction in giving or caring for others along the way. This was the beginning in a series of unfortunate events to plague Collins. In April of 2005 she was deported from the US, and shortly after that she was diagnosed with Leukemia. But, much like her fun themed comics, Collins did not lose sight of what was important to her. In September 2006, after her recovery she took a course in social work and by August 2007 she was working for a non-profit agency. Katherine continues to do social work to this day, still in Vancouver, where she considers getting back into comics. She still reads them extensively. April 2017 – It looks like the Collected Neil the Horse project is finally seeing print, courtesy of Conundrum Press. Canadian (BC) cartoonist, writer, historian, stage performer, composer and media personality. Creator of Neil the Horse in 1975, published initially in Canadian newspapers for Great Lakes Publishing, and later jumped to comic books (Aardvark-Vanaheim/Renegade Press). Neil was the first all-singing, all-dancing musical comic book, with sheet music included. In 1979, wrote and produced a 5-part documentary series for CBC radio entitled the Continuous Art exploring the cultural impact of comics, featuring interviews with many renowned cartoonists (many of which were published in the Comics Journal). Retired from comics in 1991 after Neil the Horse’s last appearance in Fantagraphics’ Critters #6, although an unpublished Neil the Horse graphic novel is said to exist. 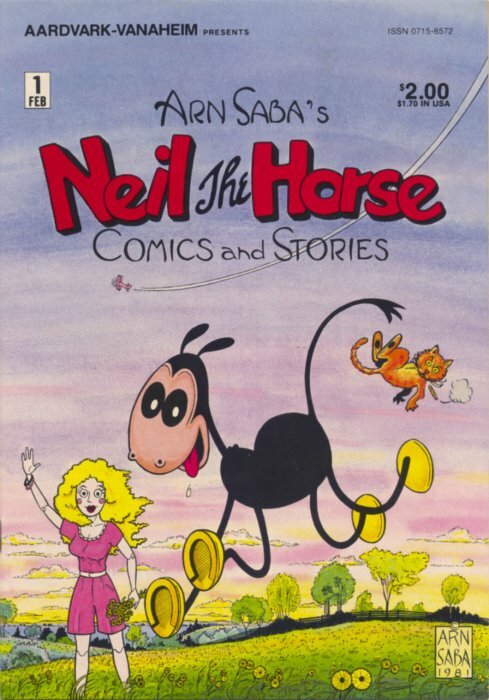 Following on the news that Katherine Collins will be inducted into the Canadian Comic Book Creator Hall of Fame comes the news that Arn Saba’s Neil The Horse Complete Comics Stories Hardcover has been announced for a fall release from Hermes Press. Neil the Horse has long been acclaimed as one of the most innovative and charming comic creations of the 1980s. It has often been compared to the best work of Walt Disney; fans of the strip will finally be treated to a comprehensive reprint of this important strip. Now for the first time ever all of the classic Neil the Horse comic books are collected together in the definitive archival edition. Fully authorized by its creator this book is reproduced from the original artwork. Neil the Horse ran 15 issues in the 1980s. With its tagline, “Making the World Safe for Musical Comedy” it is the world’s only musical comic book. It is a totally original hybrid influenced more by Carl Barks and Fred Astaire than by the underground comics of the time. Originally produced under the name Arn Saba, Neil’s creator transitioned to Katherine Collins after the last issue. Neil and his friends Soapy and Mam’selle Poupée are a struggling song-and-dance act. Neil is a happy-go-lucky horse with a mania for bananas. Mam’selle Poupée is a romantic and lovelorn living doll from France, whose wooden body is jointed with hinges. With red circles on her cheeks, curly blonde hair, and large bust, Poupée appears to be a cross between Raggedy Ann and Dolly Parton. Soapy is a street-wise and cynical (with a heart of gold) orange alley cat, a cigar smoker and a drinker, who serves as the brains of the operation. Their magical and absurd adventures take them to outer space, the past, and the future in a mix of slapstick, romance and show business. The book includes brand-new commentary by Collins, rare art, sheet music to accompany the stories, and reprints of early syndicated newspaper strips. Katherine Collins, born in Vancouver, was known as Arn Saba until 1993 when she came out as a trans-woman. Arn’s mother and great-grandmother were both published cartoonists, and he started drawing comics at around age six. In 1977, he moved to Toronto and began appearing on, and eventually writing and producing for, the CBC Radio program Morningside, and other shows. He produced nearly 100 skits, adapting classic newspaper strips. In 1979, he wrote and produced The Continuous Art, a five-part CBC documentary, exploring comics’ cultural ghettoization. It featured interviews with some of cartooning’s greatest names. His character Neil the Horse ran in Canadian newspapers from 1975-1982, and subsequently starred in fifteen comic books, from 1983–88. Neil was the first (and last) musical comic book, with original songs. There was a five-part Neil musical comedy play on CBC in 1982. In 1993, Katherine was obliged to leave comics. This year’s Neil book is her first return to the field.